Chorizo is great for breakfast. Fry it up and scramble in a few eggs. This is wonderful by itself, or with tortillas. 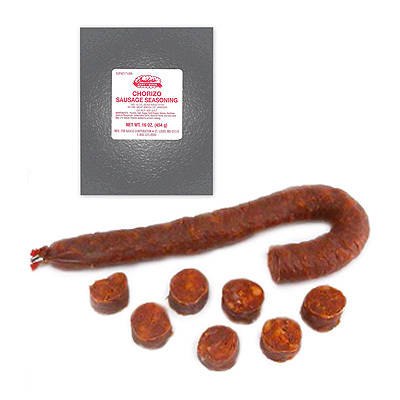 Snider's Chorizo seasoning is ground slightly more course with larger pieces of chilies and spices. Paprika, Salt, Sugar, Chili Pepper, Spices, Dextrose, Sodium Phosphate, Dehydrated Garlic, Natural Flavor And Not More Than 2% Silicon Dioxide (Added To Prevent Caking).